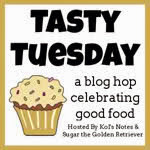 Product Review: Green & Wild's Antler Bakes dog biscuits...and a Giveaway! 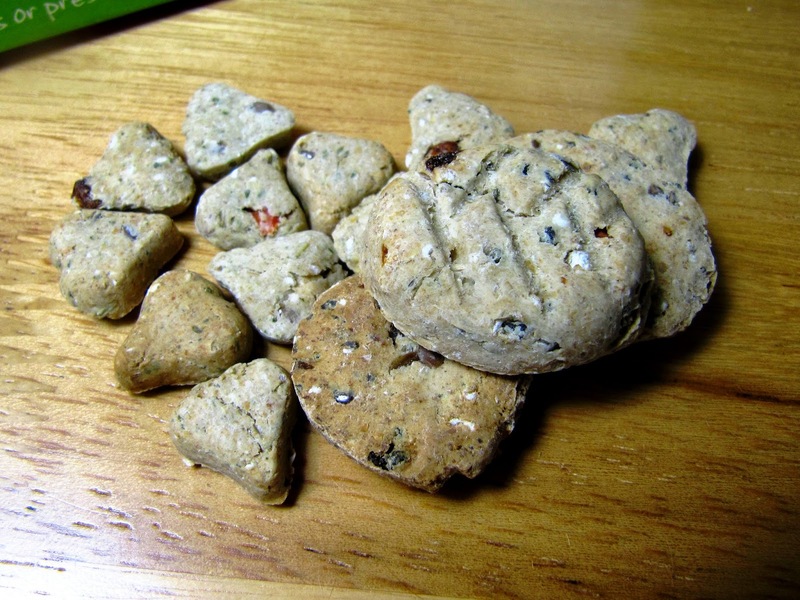 Some yumminess hit our mailbox the other day, in the form of these delicious dog treats and biscuits - as you can see, even when Hooman was trying to take photos, I was sneakily trying to get them off the table! Green & Wild's were also kind enough to send enough for us to do a little giveaway, so read on! Who are Green & Wild's? You may have already heard of them without realising it, under the name Antler Dog Chews! They are well established as a business selling all natural antler chews and eco toys for dogs and now they have branched out into baked goods for dogs, and have changed their name to reflect their increased product diversity. The company is based on strong ideological beliefs and is run by ethical, caring people, committed to looking after our planet. As a result, they pride themselves on producing wholesome, natural products, that have little impact on the planet to manufacture. All products containing the antler they are famous for, use Grade A antler which is shed naturally by free-ranging deer each year, so no deer are ever harmed. 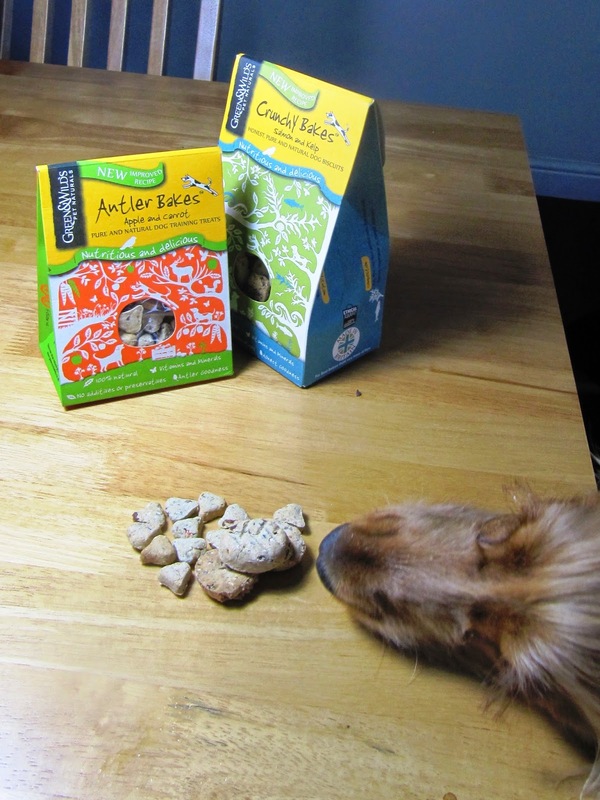 Having branched out recently into baked goods, Green & Wild's sent us their range of dog treats and biscuits to review. There are two varieties, and both are available in small sizes as dog treats, and bigger as a dog biscuit. All baked treats from Green & Wild's are wheat, preservative and artificial flavour free, and have no added salt and sugar. Only natural ingredients are used. Antler Bakes (Apple & Carrot): Containing the ground antler that Green & Wild's are famous for, these wholesome treats also contain carrots, apple, garlic, rosemary and parsley, all with a range of nutritional benefits including valuable vitamins, antioxidants, calcium, magnesium and iron, which can all help towards healthy skin, a strong musculo-skeletal systems, boosting immunity, preventing inflammation from arthritic conditions and improving bad breath. Well, it's probably quite obvious from the top photo, but I loved them! 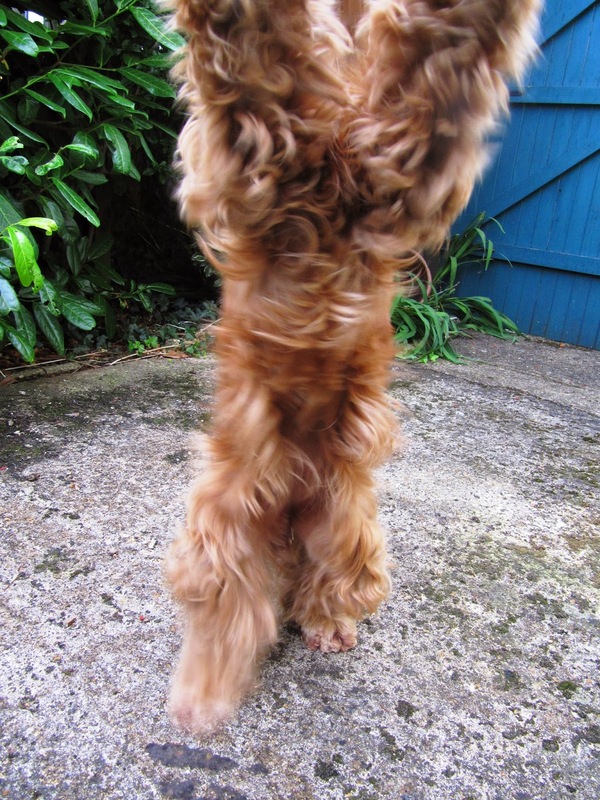 Hooman can always tell how much I love treats by the tricks I am willing to perform to get them! We also asked our doggy friends Kali the Cavachon and Eli the Nutty Dawg, to review them - positive feedback all round, with the Salmon & Kelp going down particularly well in Eli's household! We love the fact that these are only made with good wholesome ingredients - it is no secret that pet products often leave something to be desired in their ingredients list. So all round top dog marks - the training treats cost £2.79 and the biscuits cost £3.29 - you can also buy a variety of four boxes for £11.99. Clicky here for their biscuity range! They also sell of course the antler chews (a great favourite in this household), plus eco toys and venison treats and offer free delivery over £39. As already mentioned, Green & Wild's were lovely enough to send us enough boxes to be able to do a giveaway! 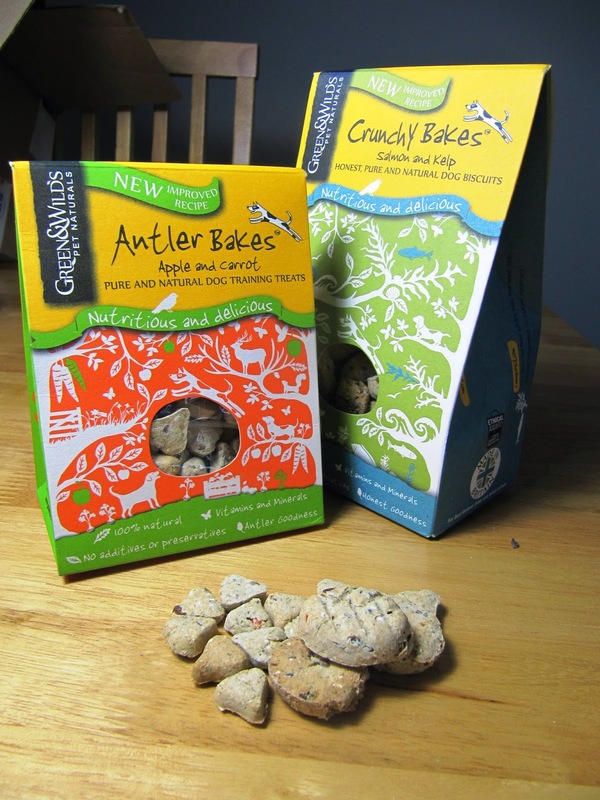 So we have a box of the Crunchy Bakes Salmon & Kelp dog treats, and the Antler Bakes Apple & Carrot dog biscuits, to give away to one lucky doglet! I'm very sorry, but this will only be open to entries from the UK and Europe only, as I am not sure of the international postage restrictions on consumables. 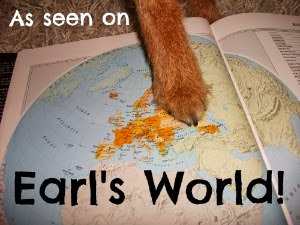 I promise the next non-dog treat prize will be open internationally! My chihuahua loves Lily's kitchen treats - I break them up and stuff the pieces inside her little Kong treat thingie-ma-bob (don't know what you call it!) and it keeps her happy for ages! 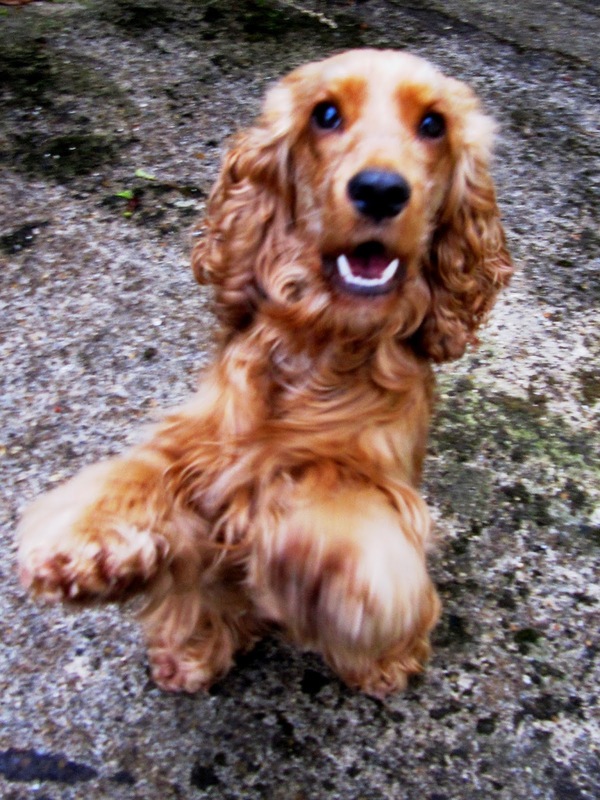 Look at you spinning for treats, Lottie! They must really be yummy! Lola adores pig's ears. 7pm is pig's ear hour and not a minute later! These sound great! Harley and Charlie love antlers and we have never seen any treats that use ground antler! my 2 Border Collies love crisp breads! She love biscuit treats all shapes and flavours along side fresh chicken and vegetables would really love the biscuit treats on offer would not last very long! My dog likes any food that is ours.... but especially peanut butter. They love marmite on toast! 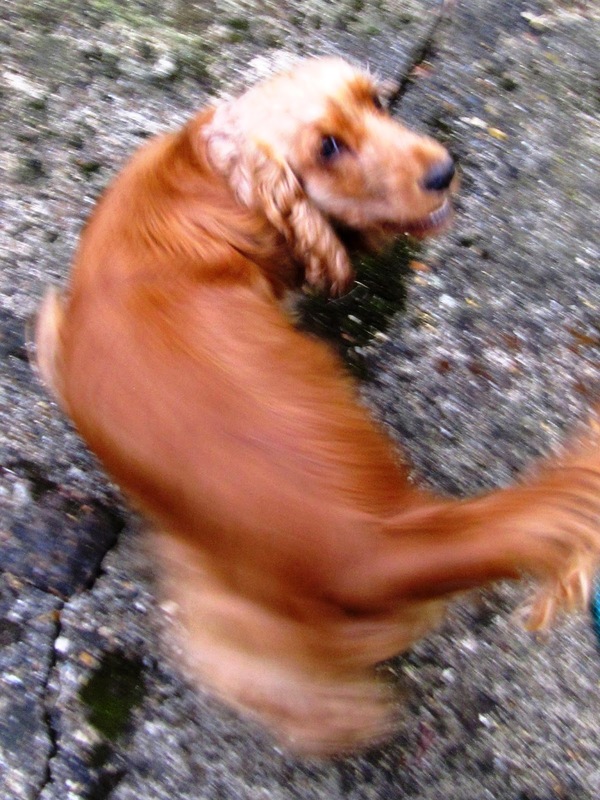 Our cocker spaniel loves bananas (and goes nuts for apples and raspberries, often picking his own off our bushes). My westie loves pigs ears but they stink and she keeps hiding them under my pillow! My poppy goes mad for strawberries especially although she likes any fruit. My Lab Molly loves dog chews, can't wait for her morning one! 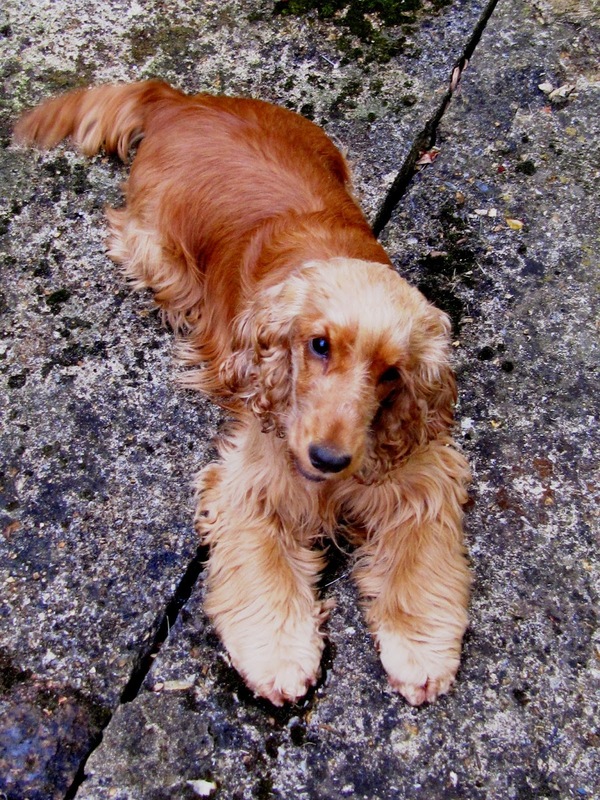 Archie's favourite treat is always chicken, he'll do anything for it..
Julia Linsley - Alfie the weinerarmer - loves yes ! CAT BISCUITS!!!!!!!!!!!! our collie loves his tripe filled bones, although he makes quite a mess and I get a growl sometimes when I try and pick it from the floor!! Missie loves a new organic bacon flavoured treat I have found, though she really has a complete fetish for raw carrots. When I am cooking if she sees me peeling carrots she will sit at my feet whining until she gets one. My cocker spaniel loves red peppers and peas. Fave is defo liver! Our Zoe goes nuts for tuna. Anything fruity - picking the blackberries off the bushes at the moment.